Artful doings are afoot (literally) at the Naples Pier! On Saturday, April 13, city and county dignitaries, lovers of public art, local families and visitors and those who have a special place in their hearts for children suffering from neglect and abuse ––will join together to put their toes in the sand and plant the most unusual beach garden ever seen: a shimmering display of thousands of silver and blue toy pinwheels, just steps from the water’s edge. It will take approximately four thousand pinwheels to make the design, which will form the shape of a giant flowerpot containing one enormous flower. The sparkle of all those pinwheels turning in the breeze will be visible as far as a mile along the beach in both directions, and viewed from the Pier or the air it will be a stunning work of public art. 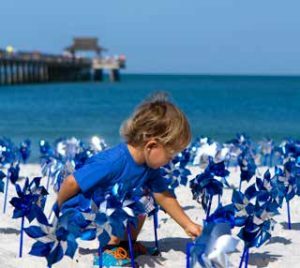 The massive pinwheel display is the focal point of Pinwheels at the Pier, the annual event created by the Children’s Advocacy Center of Collier County in recognition of National Child Abuse Prevention Month. Pinwheels are the symbol of hope for abused children, and each April, “gardens” of toy pinwheels bloom all over the U.S.
Pinwheels will be available beginning at 8:30 a.m. on Saturday morning. There will be an official counting ceremony at 10 a.m. The honorary chair of the event and emcee for the ceremony will be popular NBC-2 News anchor Peter Busch. Mayor Bill Barnett will present a special proclamation. Award winning singer-songwriter Carlene Thissen has written a special song for the children served by the CAC, which she will sing at the ceremony and for beachgoers during the morning. There will be a drawing for prizes after the count. Winners need not be present at the drawing. For more oohs, aahs, and photo ops, sand artist Dan Duling will be putting the finishing touches on another one of his amazing sculptures. Duling’s sand sculptures, which take three to four days to produce and can last several days depending on weather, pop up about once a year or so to the delight of beachgoers at Doctor’s Pass in Old Naples. 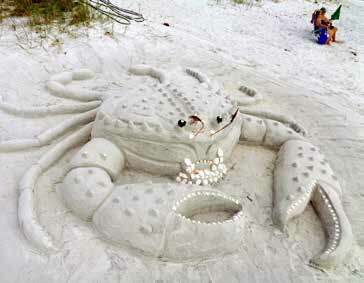 This will be his first sand sculpture on the beach at the Pier. His largest sand sculpture to date was a 40’ x 30’ sand dragon. A real child-pleaser was his life-size T.rex eating a small dinosaur. He also has charmed sports fans with college themes, and his holiday sculptures are always a treat. “I’m not saying what I’ll be doing this time,” he says, “but it will NOT be small.” Come spend a lovely, artful April morning being part of Naples history in the making, and at the same time, show your support for the work of the Children’s Advocacy Center of Collier County. While the sand sculpture should remain for several days, the pinwheel display will remain intact until early afternoon for photo ops, and then all the pinwheels will be safely gathered and stored until next year. 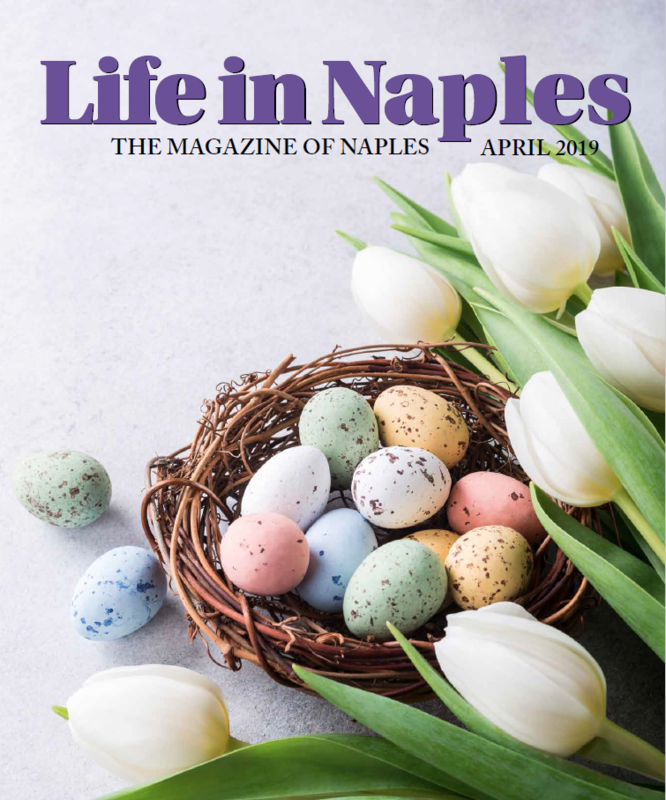 Corporate sponsors include NCH Healthcare System, Sunmaster of Naples, Capital Bank, Forge Engineering, Iberia Bank, Realpro Realty, Summerfields Home, Garden & Gifts, Venue Naples, Crave Culinaire, Tacos & Tequila, BSSW Architects, and Life in Naples Magazine among others. For more than three decades, the CAC has been the only first response facility for Collier County children in imminent danger due to abuse and neglect. The 501c3 organization also advocates for the child/family in court, teaches parenting classes, and offers safe visitation for families in a child-friendly environment. Program funding comes from special events, government grants and private donations. 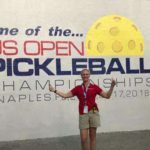 For more about the CAC and the World Record attempt on April 13, visit caccollier.org, or on Facebook at Children’s Advocacy Collier.